On a day like this we should not mince words. We should say it like it is. By KGALEMA MOTLANTHE. Today is the day on which we close the eyes of comrade Kathrada, permanently; because during his lifetime he opened ours forever and saved us from the blindness of the heart. Along with countless men and women of a higher order of consciousness with whom he cast his lot in pursuance of deep ideals, comrade Kathy helped unleash human possibilities. Warts and all, post-apartheid South Africa is an attestation of such human possibility that comrade Kathy and his generation and those before him dared to imagine. In this subversive act of opening our eyes he made us believe in our inherent ability to create a totally new social reality. Driven by these ideals, derived from human fellowship, his subversive cast of mind succeeded in heralding a vision for a state of being that would redefine human imagination not only on the southern tip of the continent of Africa but on a global scale. The anti-apartheid struggle redefined the very notion of being human, challenging the idea of racial hierarchy historically steeped in the ethos of European enlightenment. Against the excesses of European self-consciousness that defined itself normatively and the rest as the other, comrade Kathy and a legion of his comrades refused to conform to this imposed norm and therefore canonised the historical period in which they lived. On a scale of history, this was indeed re-imagining human possibilities. Comrade Kathy never doubted for a moment even during his 26 years behind bars that this shared historical imagination would generate a new order of being for the downtrodden masses reeling under a racist yoke. After snatching Nelson Mandela and many others of his generation before him, the unaccountable hand of mortality has struck once again, snuffing out the life of one of our own, and in the process, leaves us all poorer for it. When mortality asserts itself, it does so without due regard to human emotion. Those wedded to the African metaphysics would be forgiven for attributing comrade Kathy’s departure to otherworldly conspiracy among those of his comrades who have pre-deceased him and for whom existence in the other dimension could not continue without him among their number. Those revolutionaries who have transitioned to the ages include Abdullah Abdurahman, Sol Plaatje, Lillian Ngoyi, Bram Fischer, Helen Joseph, Dullar Omar, Nelson Mandela, Kader Asmal, Walter Sisulu, Harold Wolpe, Oliver Tambo, Alias Motswaledi, Arthur Goldreich, Joe Slovo, Moses Kotane, Monty Naicker, Moses Mabida, Amina Cachalia, Ruth First, Ahmed Timol, Raymond Mhlaba, JB Marks, Govan Mbeki, Yusuf Dadoo, Solomon Mahlangu and many more. All these revolutionaries shared a common vision with him; a vision steeped in a transcendent notion of human possibility. It may very well be that they felt incomplete without his diligence, his contagious banter, his humility, and his ability to exude human fellowship. After 87 years of exemplary life, comrade Kathrada has succumbed to mortality, as did all these comrades before him, as will all of us, when our hour strikes. And so it is that during moments like this, the fragility of the human condition whips up feelings of hurt, sorrow, grief and pain in all of us whom he leaves behind. Yet we may choose to look at things on the bright side. If we did, we would realise that such a life as that of comrade Kathy is worth celebrating. A sense of fortitude would counsel to offset the pain of his mortality with the immortality of his legacy. What he and his political organisation, the ANC, stood for, has for ever enriched human experience. We should take comfort from the immortality of the idea that defined his social existence, the idea of freedom … his vision will always remain etched in historical memory. Each day that we enjoy our freedom is the ultimate expression of gratitude to comrade Kathy and all those who, like him, fought to a standstill against human oppression articulated in the discourse of racialisation. His legacy finds voluble expression in the centrality of the idea that his life radiated; the idea that we have the ability to create a new form of life. A new form of life anchored on unity, democracy, non-racialism, non-sexism and justice. These principles, which comrade Kathy lived for all his life, were not just hollow statements. They are foundational to a new form of life. It would be disingenuous to pay tribute to the life of comrade Ahmed Kathrada and pretend that he was not deeply disturbed by the current post-apartheid failure of politics. In this regard we need not put words into his mouth post facto or posthumously; since, true to his consistent principles, he penned a public letter to the President of our country in which he gave vent to his views about the state of the in which our nation finds itself. “I have always maintained a position of not speaking out publicly about any difference I may harbour against my leaders and my organisation, the ANC. I would only have done so when I thought that some important organisational matters compel me to raise my concerns. “And bluntly, if not arrogantly, in the face of such persistently widespread criticism, condemnation and demand, is it asking too much to express the hope that you will choose the correct way that is gaining momentum, to consider stepping down”. For better or for worse, what comrade Kathy stood for never changed according to the fluidities of history. He held on to the immutable laws of history in so far as they were prescriptive of what is most desirable for human life. Comrade Kathy took exception to the current the culture of feeding frenzy, moral corruption, societal depravity, political dissolution, the gross and sleaze enveloping human mind that would put to shame even some of the vilest political orders known to human history. He found current South African political leadership wanting on many fronts that he mentions in his letter and could not hesitate to call for the resignation of the President of the country with whom the buck stops. Once again, here is to the human possibility. Just when a dispassionate observer could have thought the ravages of age have deprived him of his trademark intellectual vitality, comrade Kathy let rip in his vintage moral mode. Yet he remained for ever measured, a towering moral icon who would not compromise with anything outside the framework of superior human values. In this connection, he was once again reaffirming the courage, humility, selflessness and generosity of freedom fighters within the cultural framework of self-reflection. Indeed a measure of self-reflection is needed if human civilisation is to endure. The ANC itself may disappear off the face of the earth if it fails to embrace the culture of self-reflection from time to time concerning its character and inner soul as a governing party. Comrade Kathy himself deemed a critique of current democratic government a pre-condition to the sustenance of our democracy. For him the mainsprings of a cultured politics is the practice of truth-telling; being honest, expressive and unambiguous in public discourse. Self-reflection means a process of subjective becoming by consciously grappling with objective reality. The process of self-reflection makes and remakes our subjectivity. Self-reflection amounts to questioning the very basis of the underlying postulates that frame the way we do things. Without self-reflection human beings degenerate into a depersonalised state of parrotry, conformity and robotics. In equal measure comrade Kathy was troubled by the noxious climate of racism consuming the soul of our nation. 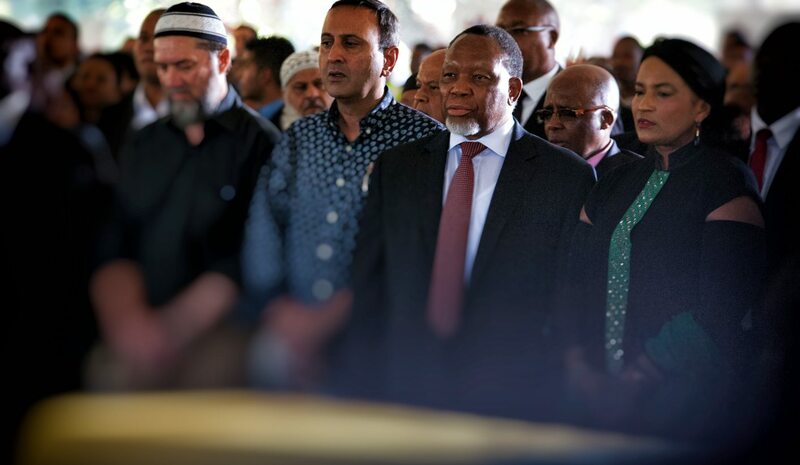 He established the Ahmed Kathrada Foundation with the central tenet of fighting the monster of racism, driven by the understanding that the onset of April 1994 did not mark the social end of racist practices. It worth noting that comrade Kathrada remained politically engaged with the challenges of his time to the very last minute of his life. He never tired, nor let the fragility of old age stand in his way. He was a redoubtable, diligent and passionate activist for social change and justice; the very metaphor for human agency.